There’s a compelling and growing list of reasons to delete your Facebook account. Here are the top 10 that are prompting me to delete (and not just disable) mine. With the announced departure of Alex Stamos (Facebook’s Chief Security Officer), it’s clear that the internal revenue v. privacy battle happened — and privacy lost. Cambridge Analytica was just the tip of the iceberg. There’s an entire ecosystem of companies that have been exploiting this exact same loophol for years — and Facebook knew it. Facebook has also been collecting call and text message data from Android users — also for years. The Facebook UI/UX is brutally ugly and never matured beyond it’s original design. It has the same look and feel of earlier ‘walled gardens’ like ‘You’ve Got Mail’ AOL. Like AOL — there’s never any real change — just migration, decline and atrophy. Facebook isn’t the only option for sharing and communicating online. Sure, it has over 2 billion users worldwide (and it is the internet in other countries), but here in the U.S. that 2 billion number is meaningless — unless, of course, you’re an advertiser. Full page apology ads in major newspapers is really just a form of mea-culpa marketing hope. It most certainly isn’t any accountability for the damage done. The FTC has confirmed an open, non-public investigation into Facebook’s privacy practices. I’m not waiting for their results. Real trust is earned and not simply the product of stealing and then applying phrases like ‘Time Well Spent’ for hours logged into Facebook. In fact, it’s a complete rip-off of a phrase that Tristan Harris used to argue against the intentionally addictive and destructive properties of social media ‘platforms’ generally — and Facebook specifically. Other early Facebook executives were well aware of the enormous damage being done by their creation — and are openly admiting to their culpability — and real regret. There’s an argument here that Facebook (and other social media ‘platforms’) can and ultimately will change. I don’t believe that’s true because they all rely on addicitive human properties like outrage that are easy to convert into enormous revenue engines. Making the platforms more civilized (with less outrage) will result in massive hits to those exact revenue engines. The only way to change it is to leave it — which is exactly what I’m doing. 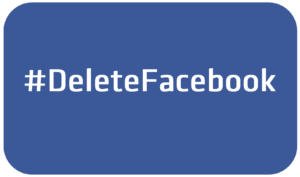 In order to gracefully exit Facebook with existing friends and connections, I’m staging my account deletion for this Friday (3/30) and here’s the step-by-step guide I’ll be using. Update: Effective 3/30 — my account has been deleted.